Rimantas Stanevicius – creative director and partner at Lithuania’s most awarded agency, Milk, located in the country’s capital, Vilnius – made the selection of digital work for this issue of our magazine. We try not to dwell on past glories. 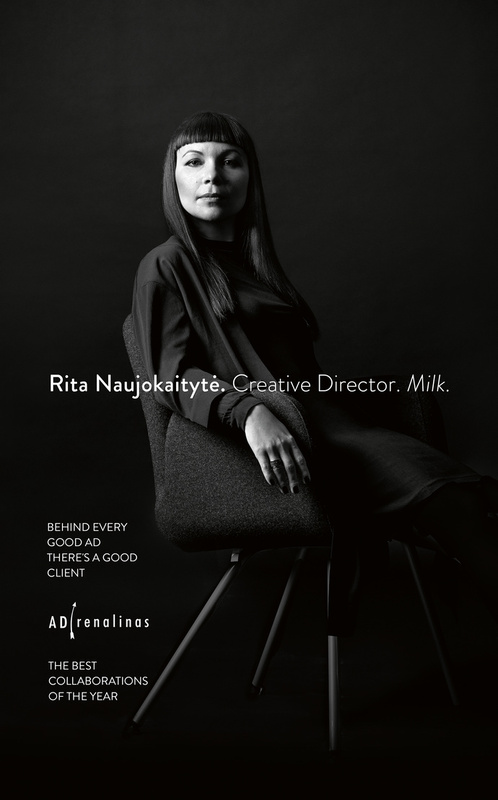 I’ve known Rimas for quite a few years (Milk once created a fabulous ad campaign for our magazine), and the interview that follows will tell you quite a lot about his background and his ideas on advertising. 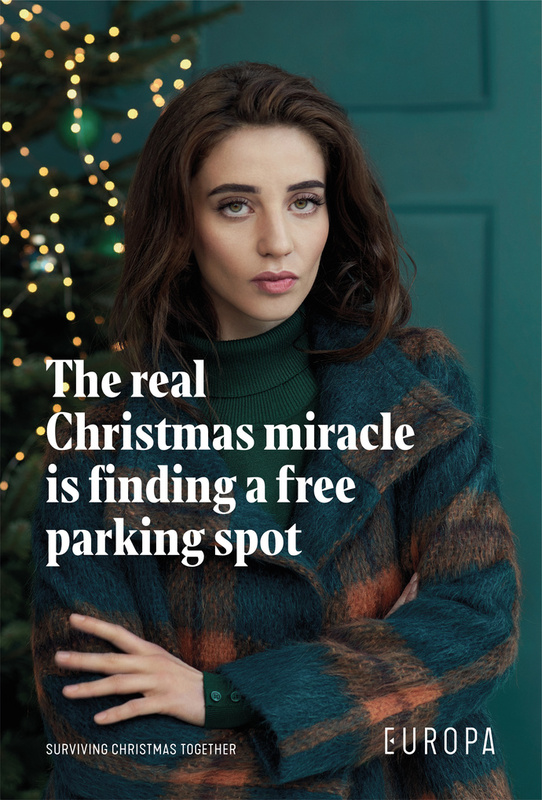 What were the criteria you applied when putting together the digital work for this issue of the magazine? I just tried to select the work that caught my attention somehow. Normally, that is either because it is something so unexpected that I would never think of it myself. Or so simple that I look at it and wonder, “How come nobody ever thought of that before?” Looking at work, I usually ask myself two questions: “Am I jealous of it?” and “Would I share it?” I don’t think I have any other special criteria for digital work. You could ask yourself whether it’s useful, whether it’s playable, entertaining, contextual, customizable, or interactive, but if you really need to go that deep, it probably means that the work is quite mediocre. Why do you think digital has become such an important medium over the past ten years or so? Sometimes, it seems to me that clients and creatives are far less interested in print campaigns and films than in dabbling in social media. Do you agree, and if so, what do you think are the reasons for that? Ten years ago, by “digital” we mostly meant internet banners, but nowadays everything is digital. Television has become digital and half of the buttons in the world are pictures of buttons on digital screens. Digital is not a medium, but merely a format. It’s cheaper, faster and much more scalable, and it’s no wonder it has become so popular and we are making less and less print ads. Clients also prefer digital because it gives them control – or at least an illusion that they’re in control. A bit like when wearing an activity tracker. You know precisely how many steps you’ve taken and how many more you should take, but just wearing the tracker doesn’t make you any fitter. Some creatives prefer digital because it’s just so much easier. Don’t get me wrong: coming up with a really good idea for digital is just as hard as coming up with a good idea for any other medium. But with digital you might be getting away with mediocre work just because you’re using the newest gimmick of a particular social media platform. Nobody would ever approve a print ad just because it fits on an A4 sheet, has colors, and says what it’s supposed to say. In print, we want an idea, a concept. Whereas with digital, and its hundreds of formats that do not really cost that much, we have a much lower benchmark. Could it be a passing trend that has, perhaps, already peaked? I don’t think digital is going away. I do think, though, that storytelling is coming back and coming to digital too. When everybody’s using the same digital tools and tricks (retargeting, SEO, UX, UI, etc. ), you still need to differentiate somehow. I’m a big believer in a return on creativity. Can you tell us a bit about yourself? What is your background? When did you first get interested in the ad business? I always say that I lied my way into advertising. Back in 1998, I was a psychology student looking for a part-time job. At my first job interview, I wanted to make an impression on my future boss and sort of said that I was doing web design, which had nothing to do with the job I was applying for and wasn’t true. But she said: “What a coincidence, we were just looking for a web designer to develop a webpage for our company and its affiliates!” I had no choice but to learn HTML and Photoshop overnight and, a month later, the page was finished. Soon after, I got a call from a company that was hosting the page on their server. They were impressed by the site and wanted to hire me as a web designer. While doing web design and learning about internet advertising, I realized I needed to merge my work and my studies. That’s why, when finishing my bachelor’s, I did my thesis on the psychology of advertising, text, color and their perception online. After that, I got into two universities and was planning to pursue two master’s degrees at the same time (one in Sweden and one in Kaunas, Lithuania), but a friend of mine told me about a job opening at Leo Burnett. At first, I hesitated but then I called them up, did the assignment, got a job and was moving to another city in less than a week’s time. Although I didn’t get to go to Sweden (for which I’ve been learning Swedish for three years), I did my master’s in communication and now, thanks to Lürzer’s Archive and their scholarship, I’m doing my EMBA at the Berlin School of Creative Leadership. You have a B.A. in psychology. Was the ad business a logical next step for you? It was and it wasn’t. I realized I wasn’t cut to be a psychotherapist and I saw that, with web design, I could earn what a shrink earns while still being a student. I do think, though, that my studies helped me to be a better creative. Perhaps you can tell us a bit about the famous Milk agency and how you wound up there? Milk was started by a bunch of people who used to work for Leo Burnett. Initially, we were around twenty people and we were all partners. I have been there since day one. In 2016, we were over 50 people and only four partners. And, now, we are two agencies, Milk and Folk. Milk is an ad agency while Folk specializes in branding and service design. You have been creative director and partner at Milk for 11 years. What were, or are, some of the main challenges in keeping Milk in the top spot, creatively speaking, in the Baltic region? I suppose there have been ups and downs? Do no or as little crap as possible. Maybe that is why when we would win, we would win by a large margin – we would have 50 shortlists and many bronzes. This approach has paid off for us nationally and regionally but might have held us back when it came to Cannes. We never had this one piece, this one campaign, that you could embellish and bet all your chips on. What do you guys stand for in terms of philosophy and agency culture? And has any of this changed over the years you’ve been there? We were probably the first ones in our region to preach about human advertising. How we should respect people, their intelligence and their time, and how we should be compensating them for interrupting them. How we shouldn’t only be talking about our brands. And how we shouldn’t only be talking. We’ve always believed that brands should be active in people’s lives, not just in media. With years, I guess, we’ve also grown slightly more cynical and adopted Hegarty’s view that clients get the advertising they deserve. It helps to keep your spirits up when you fail to sell a good idea again and again. As for organizational culture, there are a couple of things that come to my mind. Like many agencies, we play football, but we do it with two balls simultaneously. It’s much faster, more exciting, and you only get points for scoring both balls. This has been almost a philosophy of some sorts. For an ad to be considered a good ad at Milk, the ad has to be both creative and effective. We would send the creatively awarded stuff to our local Effies, and normally we would have a strong correlation between creativity and effectiveness. Another thing that’s unique about Milk is how we grow talent. We rarely hired people from other agencies, believing that creatives were like bonsai trees. Growing one yourself is much cooler that just going to the store and buying one. And, over the years, we have grown quite a few. In fact, seven creative directors in other agencies are ex-Milk creatives. What about digital media? Were you yourself an early adapter? I could probably say so, yes. That is, after all, how my advertising career began. I embraced digital because, without it, I would probably already be bored. After a while everything starts to feel like a déjà vu, but the changing technology brings this excitement. I don’t shy away from occasionally building a chatbot or a VR tour myself. Did you have any role models when starting out in advertising? My very first role model was Leo Burnett himself. His reaching-for-the stars philosophy has stuck with me ever since, but later I stumbled upon someone I call my role model to this day. A rare find – Howard Luck Gossage, or “Socrates of San Francisco,” as he was frequently referred to. He did not start a network agency, so not too many people know of him and his work. Using print as a medium, Gossage was doing what we now do with digital. He did engaging and interactive campaigns that would “go viral” and bring about real change. Changing the world is the only fit job for a grown man, he would say. And he did so by saving the Grand Canyon from flooding, with his print campaign helping the island of Anguilla, and introducing the world to Marshall McLuhan. This will sound very clichéd, but I get 99% of my inspiration from my daughters. For them, I have to be more creative than for my clients. They make me play “stories” with them, they make me invent stories with them, do improve theater, draw with them and for them. After that, advertising looks easy. What about the people you’ve met along the way? Who impressed you? I’ve met many amazing people, but if I had to single out someone it would probably be the late Franco Moretti, with whom I had the honor to be judging together at an ad festival in Prague. He was a firm believer in good ideas for real clients. Without knowing it, Franco inspired me to take a stand against ghost ads and scam. So much so that we boycotted the local festival until the organizers agreed to take strong action and make sure such work wouldn’t get on the show. What is the work you’ve done as a creative or creative director you’re proudest of? There must be quite a lot … And can you tell us why? 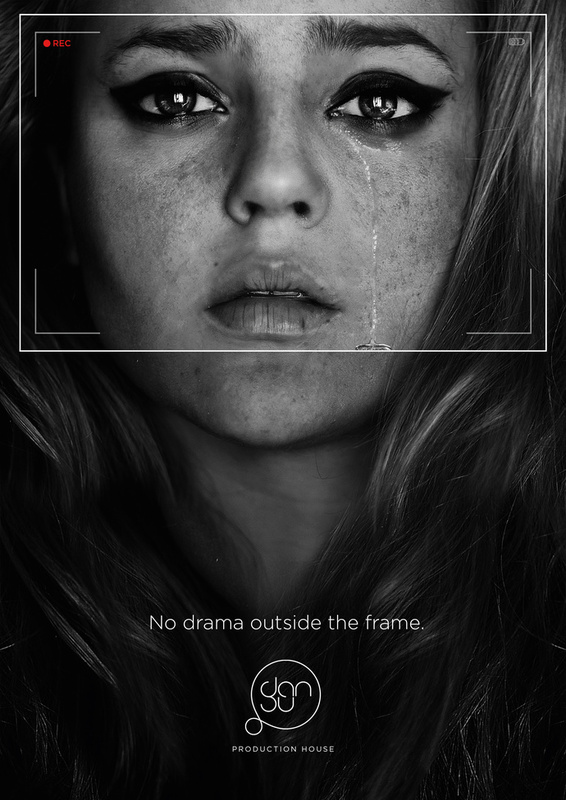 DANSU – “No Drama Outside the Frame”: It’s a print ad for a video production house that has everything under control. A classic print ad – with a visual and a copy to explain the visual. Clean and simple. A species we love, but a disappearing species nevertheless. 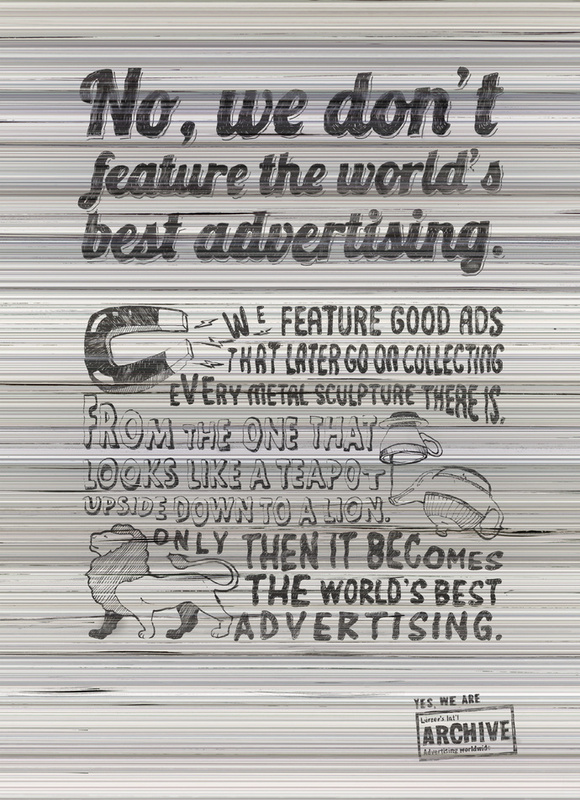 In our day-to-day work at least, a print ad has become a rare thing. Nowadays, we do more radio than we do print. The closest you get to a print ad is a so-called “key visual,” which in theory should be like a stem cell and should be able morph into anything, but in reality this anything is never anything good. 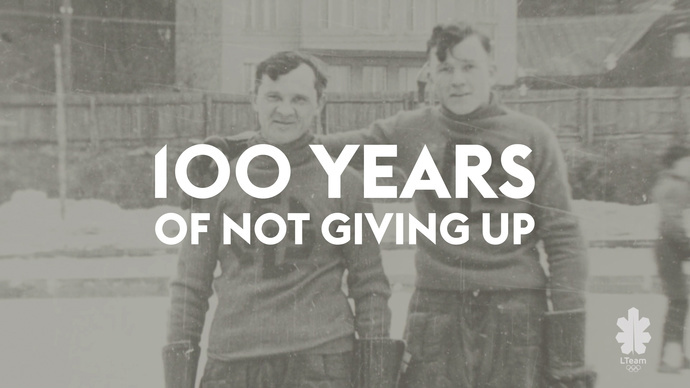 LTEAM – “A Hundred Years of Not Giving Up”: Lithuanian nationals have won gold in Winter Olympics but due to the unfortunate history of Soviet occupation it was never under their own flag. In 2018, to mark the centenary of the restoration of our independence, LTeam celebrates a hundred years of not giving up in sports too. Initially, it was an attempt to create some social media content prior to the winter games in Pyeongchang. It all started as documentary webizodes, but soon after we uncovered so much interesting but overlooked history that we decided to put the shorts together and ended up with a documentary that was aired on TV and shown in cinemas. We discovered a fascinating story of the first person to represent Lithuania in the winter games, the story of how the first Winter Olympics officially became the first Winter Olympics almost two years after the event took place. 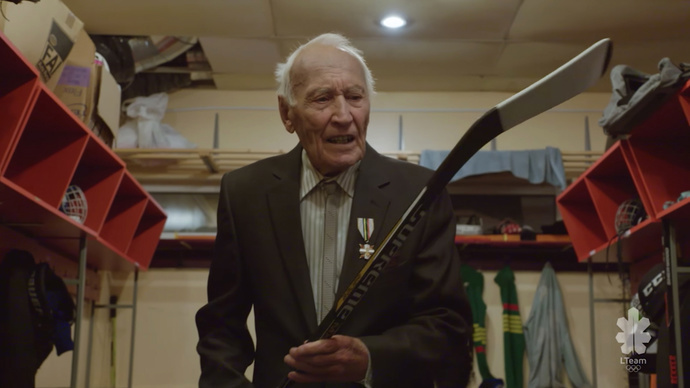 We also found and interviewed the oldest Lithuanian ice hockey player alive (104 years old), the president, and even sportsmen who emigrated from Lithuania. SIGNATO – “The Independence Font”: Another centenary project we – this time with the team from Folk – have worked on is Signato. Again, a lot of context needs to be explained. For years, Lithuania could not find the original of the 1918 declaration of our independence. It was secretly smuggled out of the country and publicized in Germany, but the document itself was lost. After years of searching, one historian located it and Lithuania managed to borrow it from Germany for the centenary celebration. However, we will have to return it. That’s why the guys from Folk decided to recreate the handwriting of the signatories and turn it into a sophisticated digital font as an Independence Day gift for every Lithuanian. So at least a small part of the declaration would remain in Lithuania and was truly ours. The team had to do a lot of research and find out which of the signatories’ handwriting it was, then find additional documents to recreate some missing symbols. To make it really feel like a handwriting, every symbol had to have multiple variations. That is why the same two letters in one word do not look the same. The gift was presented to the president, the parliament, descendants of signatories, and many different organizations. People were then invited to become signatories of the centenary online and a robotic hand placed in a museum was writing out all the names. By the end of the year, this will be turned into a book. TEDDY’S FIGHT: But all of these projects pale in comparison to Teddy’s fight. Many times in my career, I’ve been told by the client how important a project was, or even that it was a matter of life and death, but last year we worked on a project which was literally that. We were trying to raise money for the surgery of two-year-old Teddy, a son of one of our colleagues. The boy was diagnosed with a very rare form of brain cancer and the only treatment that would give him hope was available in foreign clinics that specialize in those kinds of tumors and have the most innovative technology at their disposal. It was clear that the treatment would take a lot of time and would cost hundreds of thousands of euros. Together with Teddy’s father, we carefully orchestrated a PR campaign and, with the support of numerous influencers, we got the attention of all the possible media outlets in Lithuania and even abroad. Many businesses helped the cause and famous Lithuanian musicians organized a charity concert on Teddy’s second birthday. In less than two months, we raised almost half a million for Teddy’s fight. He and his family are now in France and Teddy has gone through three surgeries already. He’s doing much better but his fight is far from being over. I wanted to use this occasion to express our gratitude to Lürzer’s Archive, and most especially its editor in chief, Michael Weinzettl, for helping Teddy’s cause. Crossing national borders was crucial because within Lithuania such an amount has never been raised for one person. Would you care to talk a little bit about Atomic Garden even though, as you told me in Berlin this summer, they no longer share the same location? Were you among the founders of Atomic Garden? Atomic Garden was actually founded in Madrid by Rafa Fortis and Rafa Gil, and then Regis Pranaitis and Aivaras Sickus decided to open a branch in Lithuania. I strongly supported the idea and, together with Antonio Bechtle, we were the first faculty directors and teachers there. After my second daughter was born, I had to take a gap year but since last year I’ve been back in the game of growing bonsai trees. What are some of the campaigns in any medium from the past year that you admire most? Besides the obvious suspects of “It’s a Tide Ad” and Apple’s HomePod, it’s probably “The Trash Isles,” the #SheDrives campaign and “Deisel.” The first one was beautifully executed and well-orchestrated. #SheDrives may not look very special, but I think the insight – that changing the law is not enough and that the most important thing is family support – was very strong. And with “Deisel” I just love it when brands are being self-ironic. I know that your inspiration is also fueled by literature and film. Can you name what you consider to be a few literary and cinematic highlights from this past year? I have a thing for sci-fi, so this past year I was all over Isaak Asimov and his Foundation and binge-watching Netflix: “Altered Carbon,” “Maniac” and, of course, “Black Mirror.” But I couldn’t say that either literature or movies are my biggest inspirations. I think I get more weird neural connections from beekeeping with my dad, doing pottery with my daughter, playing jazz on my accordion, or doing triathlons. Somehow, getting my hands dirty and being immersed into action fuels me more than anything else. “A Hundred Years of Not Giving Up” was a project for LTEAM seeking to discover the mostly unknown - and hitherto unwritten - history of Lithuania’s winter athletes in the years before the country become independent. “No Drama Outside the Frame” is a rare instance of a classic print ad for a video production company. Campaign for Europa, an upscale shopping center in Vilnius, Lithuania. 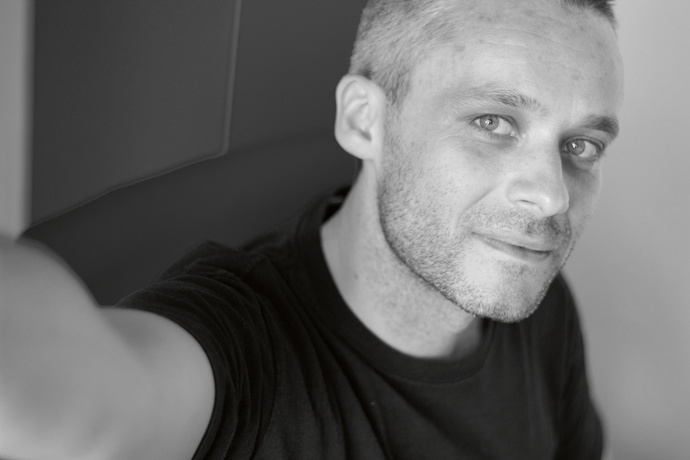 (Lürzer’s Archive 4-2018). Ad from a campaign for Lürzer’s Archive, first published in issue 3-2013. 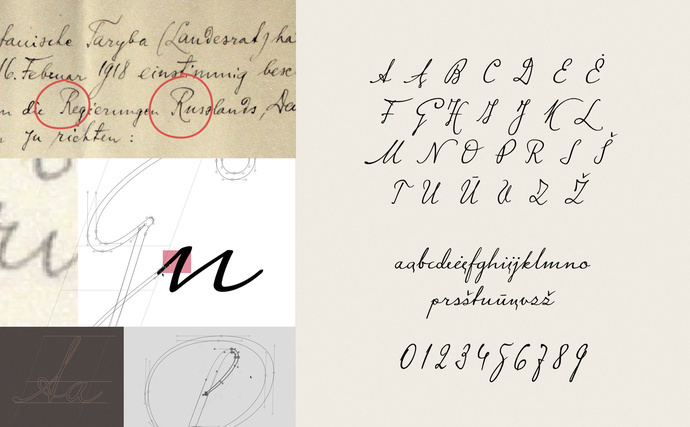 SIGNATO – “The Independence Font” was a coproduction with the team of FOLK to mark Lithuanian Independence Day. For this, the handwriting of the signatories of the original 1918 declaration of independence was turned into a sophisticated digital font.